Do you know a notable Canadian who should be included in Canadian Who's Who? We appreciate your suggestion. Canadian Who's Who editors will determine if the nominee you suggest meets the publication criteria. Canadian Who's Who has published biographies of prominent Canadians since 1910. Every year the publisher invites new individuals to complete questionnaires from which new biographies are compiled. There is no charge or obligation for the inclusion of a biography in Canadian Who's Who. Biographees are chosen on merit alone. We do not accept self nominations. Those included are selected because of the positions they hold in Canadian society, or because of the contribution they have made to life in Canada. 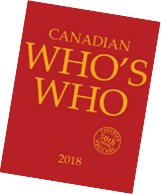 If you know of someone you feel fits the criteria of Canadian Who's Who, please fill out our nomination form, e-mail us at nominate@canadianwhoswho.ca, or call (416) 644-6479. *Tell us why this person should be included. Please indicate any major awards or significant recognition received from this person's community.